Going from left to right be have: Hit The Lights (yellow), Selena (peach), Pretty In Plum (deep purple), Scarlett (Spring Break), Love Song (purple), Naturally (pink). Quality wise, all of these shades are creamy and well pigmented with the pink or the yellow being the ones that need that extra coat to make them properly even and consistent colour. Shade wise, my top picks are the purple (Love Song) and the peach (Selena) which are both lovely shades but overall – the collection isn’t all that unique. Although on the US website it looks like the Selena range includes a selection of very pretty looking glitters – I hope these shades make it over to the UK! 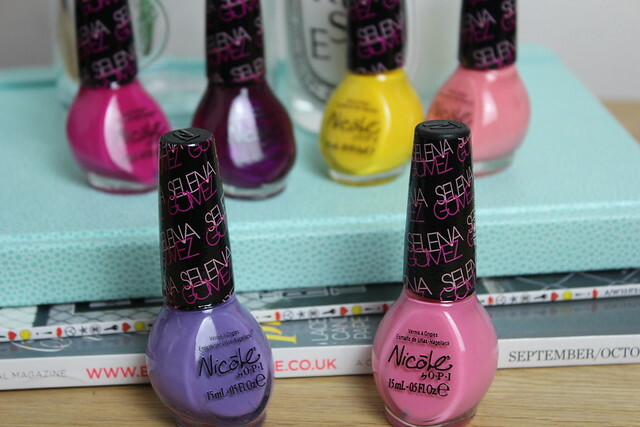 There are some lovely shades of Nicole polish around, but I can’t believe they’re so expensive compared to in the US! I’ve found some brilliant ones at Ulta for as little as $4 on clearance, think they’re normally around $7 full price.